I was born in Detroit, Michigan the firstborn to Don and Marilyn Holman, who were fourth generation Salvationists (members of The Salvation Army church). I grew up attending and growing my family in the Royal Oak Salvation Army. For 20 years I worked in the private sector as an electrical controls engineer, owning my own business for two years. 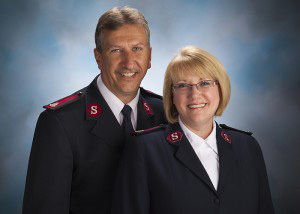 But at 38 years old, my wife and I felt the call of God to become Salvation Army officers. We are now in our 20th year of serving God and the people we minister to. The main reason I enjoy being an officer in The Salvation Army is because it gives me the opportunity to share my faith. Almost every Sunday I get the opportunity to preach and share the message of salvation to those who attend our worship service. The real joy is to see someone respond to the prompting of the Holy Spirit and watch them begin a new life in Christ. I believe what we do matters in the lives of those around us, and for eternity. Just last week we had a family come for the first time. When the invitation was given the father rose from his seat, came forward and renewed his life with Christ. Each week we pray that people will respond and begin either a renewed or a new life in Christ. Through the many programs we offer at The Salvation Army, we are privileged to provide valued support and friendship to senior adults, adults, and youth. Senior adults from around the community come here each week for fellowship, exercise and fun. They sing, they play bells, they play mind games, they exercise they even dance from time to time. They also learn from God’s Word through Bible study every Monday, Wednesday and Friday. I also grew up playing in a Salvation Army brass band which allows me the opportunity to teach young people how to play. We are blessed in this appointment to have a nice brass band that plays every Sunday for worship and also for many other occasions around our community. Sometimes ministry happens outside these four walls. Sometimes it happens on the street. It seems like every day there are people on the corners in our community who need a helping hand. One day last summer we were having meals delivered to our facility through the summer lunch program and we had leftovers, so I decided to take them to those standing on the street. You may ask; “why would you do this?” It’s because the Holy Spirit compels me to meet the needs of those who are less fortunate than me in Christ’s name without discrimination. Our mission statement clearly says that our message is based on the Bible and our ministry is motivated by the love of God. And because of our love for God He motivates us to love others in the same way. If it were not for God’s love for us we could not love others as He first loved us. Scripture tells us that the two greatest commandments are to love the Lord your God with all your heart, soul, mind and strength and love your neighbor as yourself. If we strive to obey these two commandments God will transform our community through us.